When I saw Splitcoasts's Sketch Challenge #105, I really thought it was cool and wanted to do it. But at the time it came out (first week of January!) I had no easy way to cut a large circle. No Coluzzle, no die cut. So I had to wait. I bought a Cuttlebug die cut machine and a huge Sizzix circle die, but still wasn't ready because I wanted to mat the scrapbook paper circle, and I can't cut a circle with scissors to save my life. So I had to order a Coluzzle companion circle template to mat the circle. No one ever said card making was a cheap hobby! So I finally got all the tools I needed, and here is my card. I decided to make a get well card for my mom's friend Reno, who has thrown his back out working around his house. I have totally fallen in love with my Cuttlebug machine, especially after I bought the tan polymer pad used with the Spellbinder Wizard machine for use with my Fiskars Texture plates. I got the idea from the Cuttlebug sandwich thread on Splitcoast. I used the lines plate to lightly emboss the background piece of Certainly Celery cardstock, which I trimmed down to 4x5.25", and notched the corners using the Concave Corner Adorner. For the circle portion, I used my Cuttlebug and the large Sizzix Circle die (approx. 4") to cut a piece of scrapbook paper. It is this paper that was my inspiration for the color combo I used. I then used my new Coluzzle Companion circle template to cut the mat in Rose Red. Then I trimmed the left side of the circle off approximately one inch and mounted it to the embossed piece of celery cardstock. The white tag is made from a Cuttlebug oval slider die, and it's small size makes it a bit difficult to put a sentiment on it. 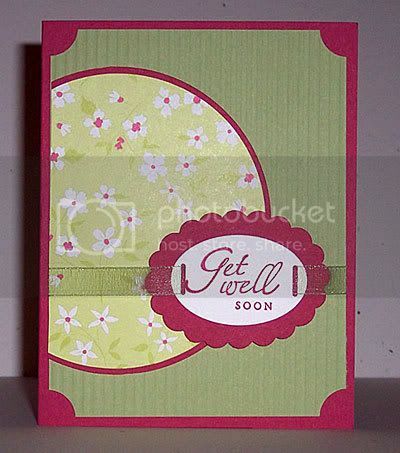 I got out my Stamp-a-ma-jig and rearranged the Get Well Soon from the Sincere Salutations stamp set from Stampin' Up! so that it would fit in the tag, using my Rose Red marker. 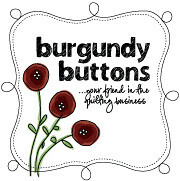 The Marvy Mega Scallop Oval punch mats the slider tag perfectly in Rose Red, and I ran Stampin' Up's celery organdy ribbon through the slots in the white tag. I mounted the tag using pop-dots and wrapped the ribbon around the cardstock and attached with adhesive. Then I mounted the entire thing on to a piece of Rose Red cardstock. Whew! I really like this sketch a lot, and plan on doing more like it in the future, now that I have all the necessary equipment!